Something that would make this kind of tool very useful for a player is a way to select the card from a drop-down list, and " + " and " - " buttons next to each of the attributes. When clicking on the "Card #1" box all card types are listed, and the player can scroll through the list to select the proper card. The same can be done for "Card #2." Modifier buttons next to each attribute can be tapped after the default values are displayed, or maybe there can be icons in the blank area at the center of the screen to modify all attributes with a single click. Imagine having an icon that indicates "higher ground," or "opponent is stunned," or whatever status types you have in the game that call for modifers. So instead of having to type in anything, you simply tap a few buttons, including those for the modifiers, and the encounter is resolved. The technology is there. It seems to me just a matter of being able to configure and link a database to your web application. I like where you are going with the "listing of cards" and the "+/- spinners" ... I'll look into those options to see how difficult and how compatible those HTML elements are. That's the problem sometimes with "technology": it's not always BACKWARDS compatible for all browsers. Now I know IE 8 and below probably don't support HTML 5 ... and I will examine those "controls" you've suggested. But I am planning to use AJAX and the asynchronous updating of the stats and so forth as "refresh-able" controls that you can tweak manually. I'll take a look into those details further. But I like what you mean! I've checked and the "Drop-down Lists" are HTML compatible and good for all browsers. So I've implemented those in the dummy table and it should be good and compatible for all browsers. I'll dynamically load the list based on the PHP source CSV file which contains all the "different cards and stats". So this is very possible. HOWEVER your "+1/-1" Spinners are only HTML 5 compatible. So because of this, I will NOT be implementing the spinners. I know most people are using HTML 5 compatible browsers but IE 8 is NOT compatible and there are still some people using that browser today. So 50% of your suggestions is better than none... And quite frankly I'm a bit disappointed that the SPINNERS were not IE 8 compatible. Oh well ... we live with what we have. I created some bit-maps (16 x 16 pixels) icons for the STATS. It looks a bit more presentable. In the screenshot, I feature let-off's request for drop-down lists for the cards. I could not implement spinners (+/-) at a glance because they are for HTML 5 only and it's not supported by IE 8.0. Anyhow if anyone has additional comments, feel free to post. Now the calculator refreshes when you select a card from the dropdown list and uses an ASYNC call (AJAX) to get the card information and then plugs in the values into each text box (automatically). When you modify a value in the text boxes, it will turn that value GREEN to indicate you have modified a stat. If the input is non-numeric, it will turn RED (to indicate a bad value) and now that stat will be treated as a 0. The RESET button restores the card's default values before editing. Although the calculator re-calculates selections automatically, when you plug in custom "Tribute" adjustments (+/-), you must click on "Calculate" to get the correct amount. It's taken me about 1 day to get it all working (8 hours). I wanted something that has a TINY "footprint" and this webpage does exactly that. No need to "refresh the page continually", requires only ONE loading (initial)... After that it can operate with minimal amount of bandwidth. So it's not a HOG on your DATA PLAN when you use it via your MOBILE device (SmartPhone). Over the weekend ... I plan to put it ONLINE. And try it out! You can probably embed the data you are retrieving from your AJAX call in a JSON on the page. This would increase the foot print some, but has the advantages of being more responsive and being able to work even the internet connection is broken. You can also bind an event to the onkeyup event to make so that the user does not have to click on the calculate button. Feel free to reach out via PM if I can be of assistance. Good luck with your page. Cool. But I've already implemented the data file as a CSV. To update the calculator, all I need to do is update the CSV and the website can compute more values. But kudos to you about thinking about using JSON. I looked it up and yeah I could put all the SERVER-SIDE code into the CLIENT... But then that's probably not a good "best practice". I actually WANT to force clicking the "Calculate" button when Tribute values are specified. So for DEFAULT cards and NO "tribute", the computation is already AUTOMATIC. Therefore I am already doing something similar (I am capturing the 'onchange' events from the combo boxes). I saw the Number HTML 5 element. Did not know that they can "degrade" into just regular text fields... Again thanks for the "heads-up"... It's good to know. But I tried to keep it as BACKWARDS compatible as possible. But thank you for your advice... I've pretty much considered all except the JSON and I don't want to embed "server-side" data into the client. The AJAX calls are relatively FAST. And they protect the content from malicious editing (like if we used Johnny's HACKED version, the computations might be different than the GENUINE version...) Never know...! "Note: < input > elements with type="number" are not supported in Internet Explorer 9 and earlier versions." This to me doesn't sound like "backward compatibility" or "degrade" support. But I could be wrong...!? 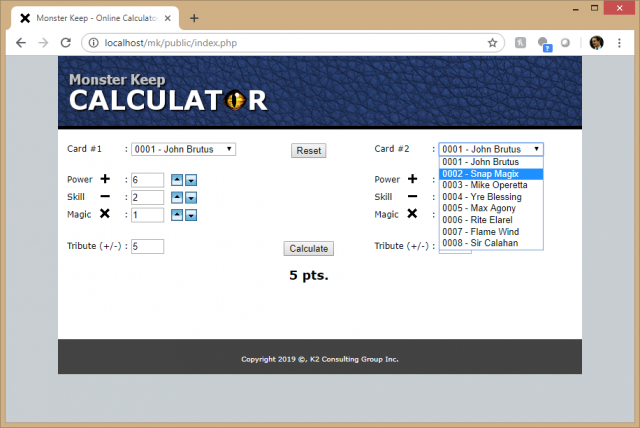 Well I uploaded the most RECENT version of the "Monster Keep" (MK) Online Calculator!!! What is COOL about this is? Well I created the domain, configured the NameServers and uploaded ALL of my "Monster Keep" (MK) calculator files. When I browse the page it looks all great from my laptop or PC. BUT when I view the site on my SmartPhone... It's a bit of a different story. Let me explain. While the "spinners" work great on the laptop or PC, they are so freaken SMALL on the SmartPhone, you need to constantly Zoom In/Zoom Out to be able to use those buttons. The other point is that the "textboxes" are rather SMALL too! It's like the AWESOME design on laptop or PC is GREAT ... but is a HORROR STORY on the "SmartPhone". It's just NOT a "functional" design. One thing that I learned today is DEFINITELY a DIFFERENCE between what you SEE on your PHONE and what you see on your laptop/PC. I don't think this will INFLUENCE the "core" of the site... You'll still use AJAX and there will still be two (2) buttons. But everything will be LARGER and there will be a NARROWER page (let's see IF I can design something that will look reasonable on the "SmartPhone"). This will be my project for NEXT week (starting on Monday). I'll sit down and get a few LAYOUT ideas and see what works best. I have some ideas that seem cool ... but I'll need to see what is FEASIBLE and what is too "creative" for HTML 4.01. But I finally worked out the files and the Mobile-vs-PC code to ensure that I could automate everything via the web. Update: This mobile-friendly version is also compatible with IE 8.0 ... but I doubt such an OLD browser will be installed with most modern day "SmartPhones". Maybe the old Blackberries may require compatibility. I found it STRANGE that the browser would OPEN and the mobile page would be so SMALL! I Googled a bit and found the missing piece: on mobile devices you require a viewport up in the HEAD of the HTML (or PHP) page. I modified the SERVER's files and ... VOILA it now appears BIG (Full Screen almost) and you can of course Zoom In more (which is okay). But you can't shrink the page any smaller (which is what I wanted). Pretty darn cool all this "technology"! I really think this TOOL is good for the game (and its players). But moreover, it allows me to DESIGN "New" cards and TEST them out "locally" on my computer before even releasing them to the public ... I mean, yes the cards need artwork but just the STATS alone can be compared to the "existing" cards and see how they interact (well or not) with the other cards in the collection. Really, really am happy that I took last week to design, code, test and deploy this tool. It's been helping me out (playtesting) and designing stretch goal cards too!